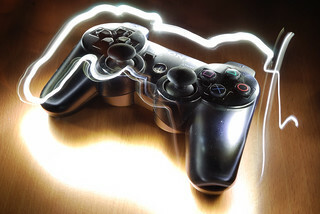 Photo: Light Graffiti – PS3 Controller by artwork_rebel. These seem to range from $10 to $40ish. I picked mine up from FutureShop here in Canada for $19 on a Boxing Day special… but many retailers seem to have them for about that amount as their regular price. (1)These might be hard to find now, but weren’t when I wrote the article. Hopefully other inexpensive solutions are available. If you know of one, please let us know in the comments. Syba SD-CM-UAUD USB Stereo Audio Adapter (Link to an example of this adapter on Newegg…) I picked one up locally at NCIX for like $10, but Newegg has them for $9. You might find them at a local store to save the shipping, but I couldn’t believe the price. It works great with the PS3. As you can see in the first photo (see: Headset Wiring), I have plugged the Syba adapter into a USB extension cable, and the pink plug of the Plantronics into the pink plug on the adapter. I have plugged the other plug of the Plantronics into a simple audio extension cable. (The cord on the Plantronics headset is, IMO, a bit short). Next (see: Stereo PS3 Connection), I plugged the USB into my PS3, and the audio cable into the headset jack on my stereo system. You might do the same or hook it to the headset jack on your TV, for example. This will give you all the audio output (voice and game sounds) through the earphones of the headset, and the USB provides the Mic input to the PS3. Now, just set the PS3 settings properly (see: PS3 Audio Settings). I put the mic level at 4 or 5. Set the input device to the Syba adapter (C-Media USB Audio Device). Set the Output device to the ‘System Default Device’. This runs the voice you’d normally get back through a headset to the same place as game sounds… which all end up coming into your Plantronics headphones. The .Audio 370 headset sounds pretty good and works incredibly well in games, IMO. You should be able to use any PC headset with this adapter… of course sound quality and mic quality will vary. So, I basically have $29 invested in this setup. Not bad at all for the high quality level. (2)This is an article I posted on the PS3 forums on 10-20-2009 (I modified it a bit to update things). It is kind of buried there, and I have friends with new PS3s thinking about setting this up. Enjoy! 1. ⇡ These might be hard to find now, but weren’t when I wrote the article. Hopefully other inexpensive solutions are available. If you know of one, please let us know in the comments. 2. ⇡ This is an article I posted on the PS3 forums on 10-20-2009 (I modified it a bit to update things). It is kind of buried there, and I have friends with new PS3s thinking about setting this up. Enjoy!